More than 500000 patients were treated with the average of 95 patients a day in OPD by our full time doctors & more than 110000 patients were treated by senior visiting consultants from nearby cities in last 20 years. More than 150000 patients were treated with the average of 30 patients a day in IPD which consists of separate Male & female General wards, Special & Semi special rooms, 24X7 Emergency room, Isolation ward. Our hospital has a team of doctors & supporting staff available round the clock to provide integrated emergent care to patients with emergencies supported by infrastructure of testing laboratories, X-ray facility, Pharmacy, operation theatres & 108 services. .
More than 5800 deliveries were conducted in our well equipped labour room with 2 birthing beds supported by baby warmers, phototherapy etc. First delivery of each needy & poor woman is conducted without any charge and free baby kit is given to the newly born child. More than 9129 pediatric patients treated in OPD & 1730 Pediatric patients in IPD. This Pediatric centre continued to develop and further expand to become the most well equipped and sophisticated tertiary care pediatric and neonatal center providing the critical care of the highest standard in the district. More than 8000 cataract surgeries including Phaco-emulsification (the PHACO) surgery with lens implant were done in separate well equipped operation theatre for ophthalmic department. Separate dental department is developed with modern dental care, scalar machine and other latest equipments in which all type of dental procedures are carried out. More than 4000 major & 15000 minor surgeries were done in three well equipped operation theaters in which risky surgical operation like meningo myllocil, mesenteric cyst, ovarian cyst, bladder stone etc., were done free of charge or with nominal charges. More than 800 outpatients/hospitalized patients were treated with the latest equipments that offer different exercise options, based on the needs of a patient. Treatment therapies include the use of heat, ice, ultrasound, short wave diathermy, TENS (Transcutaneous Nerve Stimulation), IFT (Interferential Therapy), Electrical stimulation - all these therapies relieve pain and stiffness. 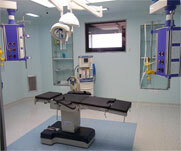 Radiology department is well equipped with state-of-the-art equipment like 300 M.A. X-Ray Machine, Portable X-Ray, Ultrasound etc. Laboratory is well equipped with cell counter to carry out latest test on patients and assist clinicians in evaluation & diagnosis of diseases. Latest instruments/equipments like Eco-cardiogram, Defibrillator, Cardiac monitor, and such other latest modern medical equipments are also equipped in the hospital for diagnostic various diseases. 108 Ambulance services are provided absolutely free right from the phone call till the point of reaching hospital by GVK EMRS in association with government of Gujarat. Serious patient requiring emergency services are provided with 24 hours Ambulance services for further outside immediate treatment. 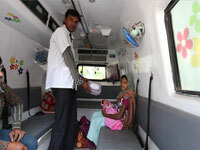 KHILKHILAT ambulance is also specially provided to drop the mother and the newborn child to their home at free of cost. The poor & needy patients are given free medicine from the government aid & affordable patients are provided medicines from the Pharmacy on no profit no loss base. 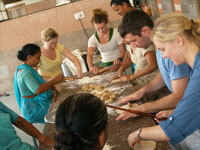 All admitted patients are given free meals as per the doctor’s advice from the trust. More than 15000 pregnant women & mothers were benefited through examination, guidance & health education by expert doctors & free distribution of Iron folic tablets & tetanus toxoid injections in the Ante natal & Post natal clinic on every Monday. More than 9000 children were given free vaccination for protecting them against six fetal diseases. All sick children are examined by pediatric doctors & given free treatment & health education to mothers on every Tuesday. Bal Sewa Kendra provides second level institutional care for inpatient management and treatment of severely malnourished children with complications. Centre provides curative & preventive treatment and nutritional care to screened malnourished children & mothers under the guidance of Nutritionist. More than 2960 family planning operations/Laparoscopy operations were done & incentive amount as per incentive scheme of govt. were given to patients. Distribution of condoms & oral pills and copper -T is placed freely. ICTC provides HIV testing with pre-test & post-test counseling, drug for opportunistic Infections. Free distribution of condoms and follow-up counseling for HIV+ve cases through field visits. Centre also provides HIV testing with pre-test & post-test counseling to pregnant mothers who come for antenatal checkups. More than 350 Malaria positive patients were given radical treatment free of cost & Blood of each & every fever patients are examined free of charge for malaria parasites in the laboratory and given free treatment for protection against malaria. Free investigations & treatments of doubtful T.B. 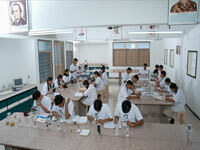 patients are carried out in our treatment centre under the national T.B. control programme through District T.B. centre. 457 patients had completed their treatment out of 762 identified T.B. patients. In the health centre besides all other services, immunization injections for protecting dog bites, snake bites are given. Free treatment to all patients under medico-legal cases & Postmortem procedures are done in the centre.